Those who have ventured up 28 on their way to Woodstock know that a selection of six artisanal locally-owned food and beverage shops exist. At these independent stores, hungry patrons are delighted by everything from fine wines to specialty groceries. Now, the six business have come together to form Eat Drink 28 a one-stop culinary collective. Eat Drink 28 is made up of Blue Mountain Bistro-to-Go, Cheese Louise, The Wine Hutch, La Bella Pasta, Hookline Fish Co. and KBBK Kombucha. Since its opening in 2007, many have enjoyed the high-quality house-made takeout offered at Blue Mountain Bistro-to-Go. Specializing in eclectic comfort food, and delicious baked goods, this shop boasts a great selection of gourmet groceries and doubles as a catering company. More than 250 international and national cheeses are available at neighboring Cheese Louise in addition to breads, cured meats, crackers, caviar, oils, and freshly made foods and soups. While nothing goes better with cheese than wine, for a choice of over 500 wines visit the Wine Hutch. This 1,800-square-foot store offers liquor as well. Newbies on the block KBBK Kombucha migrated from Brooklyn in 2015. Specializing in fermented products like house-made tempeh and kombucha, they sell kombucha brewing kits as well. Hookline Fish Co. sells different cuts of Northwest-style hot-smoked salmon, plus dishes salmon chowder, quiches, and pate. All of the salmon is smoked and the dishes are made in-house. The oldest business in the stretch, La Bella Pasta, family-owned and operated since 1985, creates fresh-made raviolis, sauces, and pastas. "We are looking for a way to make more people realize that a rare and wonderful collection of gourmet shops have found a home in this lonely stretch of Route 28. Most folks speeding past at 50mph don't realize what they're missing. Now, we hope they will slow down, pull in and give their stomachs a treat,” said Skip Card, owner of Hookline Fish Co.
On Friday, August 4 Eat Drink 28 will celebrate its grand opening from 4 to 7pm. All six businesses will hold open houses, providing samples of their products to the public. 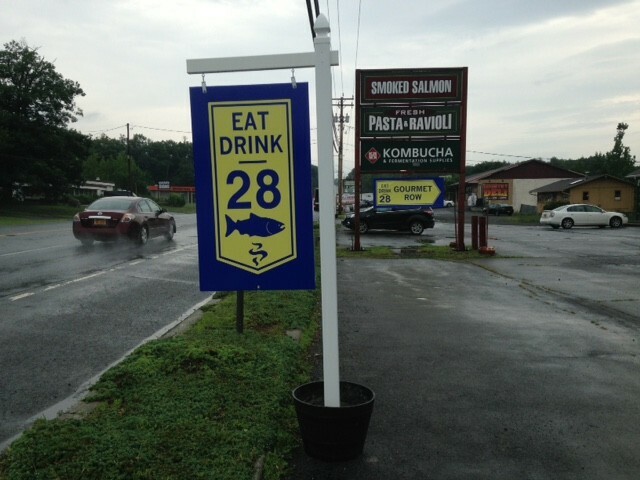 Eat Drink 28 is between Kingston and Woodstock in the 900 block of Route 28 near West Hurley, next to the Onteora Lake trailhead and across the highway from Woodstock Harley-Davidson.